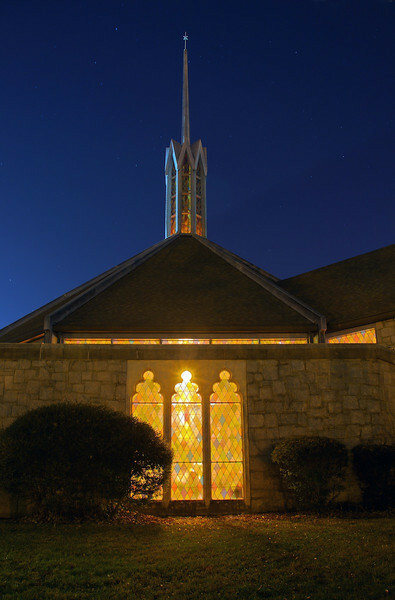 St. John's comprises two structures, the sanctuary (1959) and the Stonehenge Mansion (1919) that are located in the historic Druid Hills community of the City of Atlanta in DeKalb County, GA. The church makes the facilities available for many purposes, including weddings, religious and community groups, retreats, TV and film shoots, and more. The St. John's Sanctuary was added on to the Stonehenge Mansion in 1969. Designed by architects Barker and Cunningham it was built of the same Stone Mountain granite used in the original structure. Cap stones from the stone arches of the Front Portico were used in the doors in the Crosswalk Narthex. And similar arches were used throughout to tie the new structure in with the old. 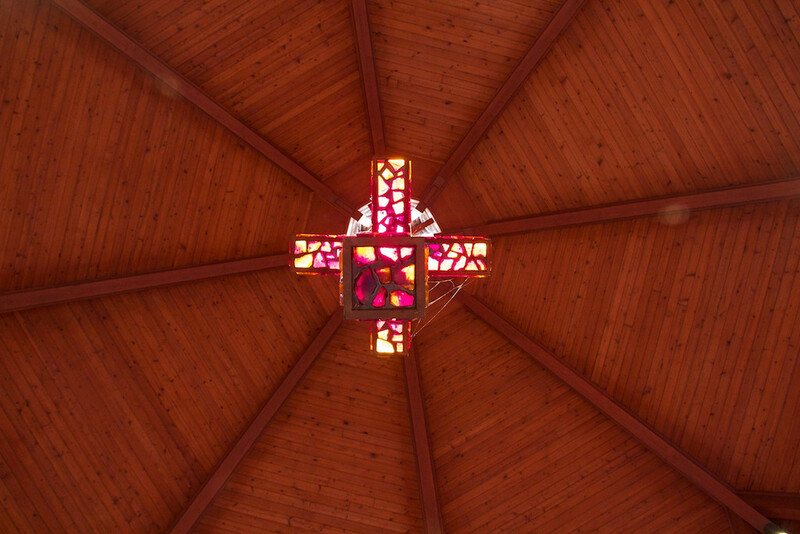 The octagonal shape, though often used in earlier periods of Church history to signify the "eighth day of creation" (our new creation through our baptism into the death and resurrection of Jesus), was considered very contemporary in 1969. Although the sanctuary will seat up to 300 people, its central altar means that no one is ever more than five rows back. This also reflects St. John's understanding of the Church as the family of God gathered around the table of God. The unusual four sided cross that hangs above the altar is made of faceted glass. The pipe organ was added in 1983, built by W. Zimmer and Sons of Charlotte, North Carolina. 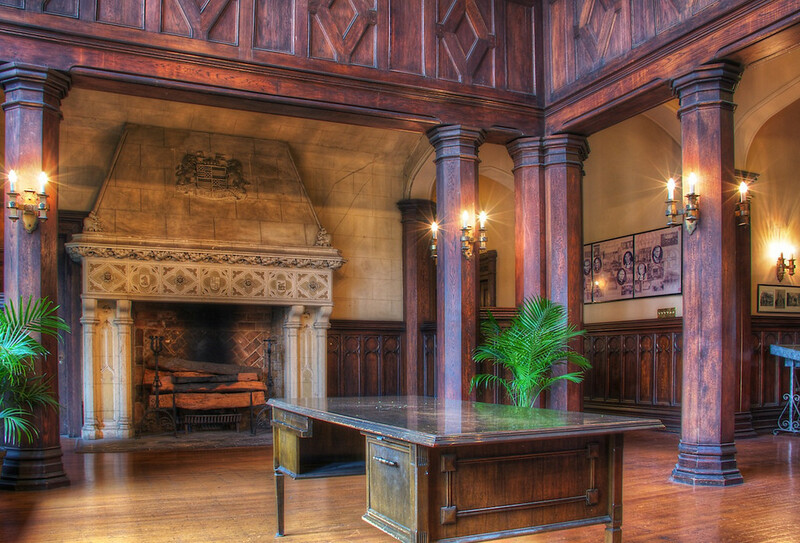 This room was designed to give the feel of the great hall of an old English Baronial Manor and features four large columns supporting a surrounding balcony. The massive Cairn Stone fireplace, twenty mullions, leaded glass windows, and a large chandelier dominate the room. 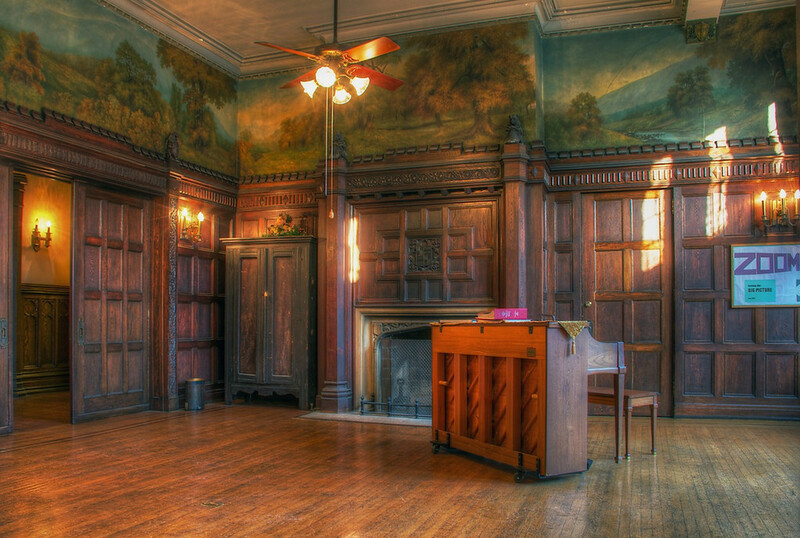 St. John's now uses this room for a number of activities including several banquets through out the year. St. John's also now makes the mansion available to the public for wedding receptions, rehearsal dinners, and other such gatherings. This room was called the Oriental room by the Venable family because of the imported Chinese grass cloth that covers the upper section of this room painted with designs from Chinese mythology; the symbolic birds of the crane, the dove, and appropriately for Atlanta, the phoenix. Today the room is primarily used as a Sunday School room and as a meeting place for small groups. This space originally contained the Breakfast Room, the Butlers Pantry, the Kitchen, a Back Porch and a Rear Stairway. When the church purchased the mansion in 1959 these rooms were removed and the support walls replaced with steel I-beams and a drop ceiling. The room served as the sanctuary for the church from 1961 to 1969 when the new sanctuary was built Since that time it has served the church as a fellowship hall, now named after a beloved pastor who retired here. Down the stairs and under the grand stairway is the Summer Parlor or Card Room. 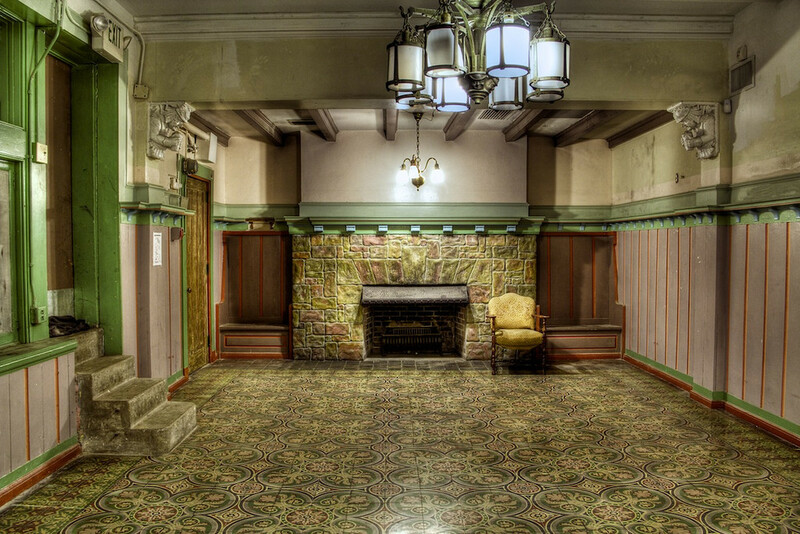 Designed to give the illusion of an old English tavern, the floor is made of the same Venetian Tiles as those found in the Sun Parlor. Murals also once graced this room but were painted over or removed. 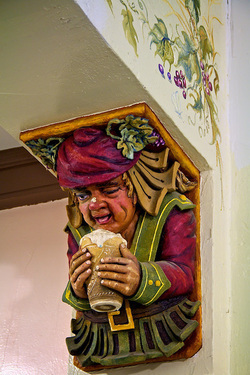 The murals were of scenes from the life of Rip Van Winkle. While the paintings are no longer present you can still see the Gnomes drinking their ale in the corners of the room supporting the heavy beams overhead. During the sixties this basement was designated as a civil defense bomb shelter for the neighborhood. You can still see the signs outside. Some of the drums once used for drinking water are still kept in the basement. 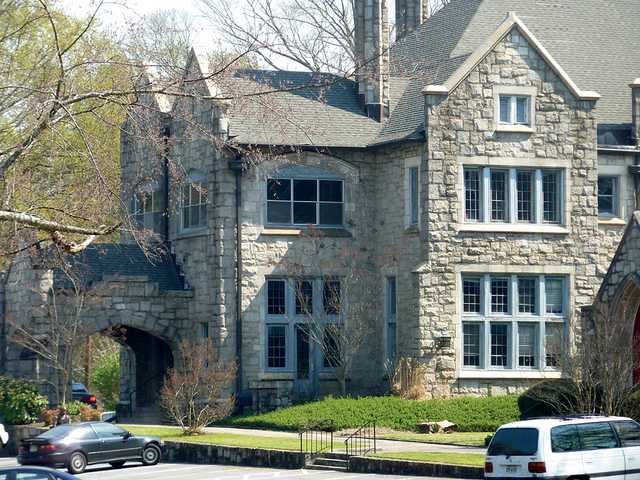 The Stonehenge Mansion was built in 1914 for Samuel Hoyt Venable, a bachelor, and his sister, Elizabeth Venable Mason, her husband, Frank Tucker Mason, and their children. The architect for the mansion was Edward Bennett Dougherty. Another of Mr. Venable's sisters, Mrs. Leilla Venable Ellis was responsible for the murals and other artwork throughout the house. 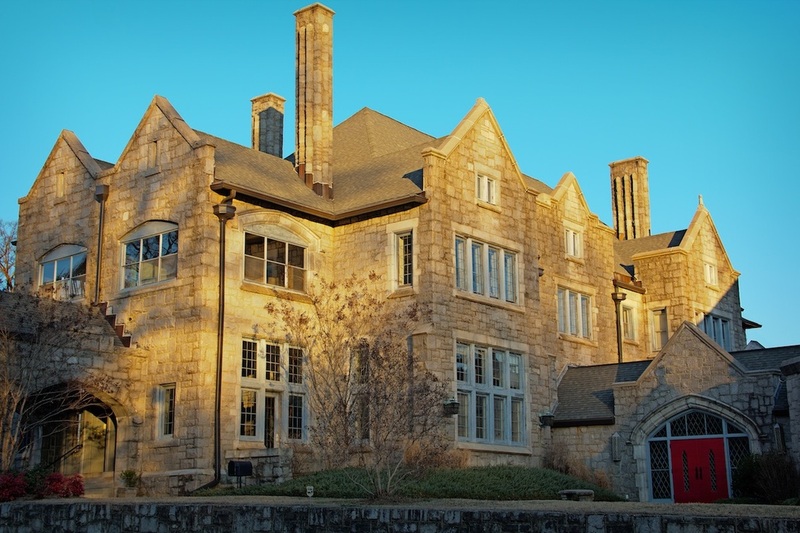 The mansion was built in the Domestic Gothic Style of the Tudor period from Stone Mountain granite. Sam Venable and his brother William Venable owned and operated the Southern Granite Company which in turn owned Stone Mountain, Arabia Mountain, and Pine Mountain. Naturally, they chose granite as the primary building material for their home. St. John's Lutheran Church bought the mansion in 1959 for some sixty thousand dollars and spent another fifty thousand dollars renovating it for its new use as a church. The sanctuary was added in 1969. Designed by architects Barker and Cunningham, they used the same Stone Mountain granite as the original structure. The library is paneled in mahogany with a beamed ceiling of an unusual design. The leaded glass book cases and windows are original to the room. 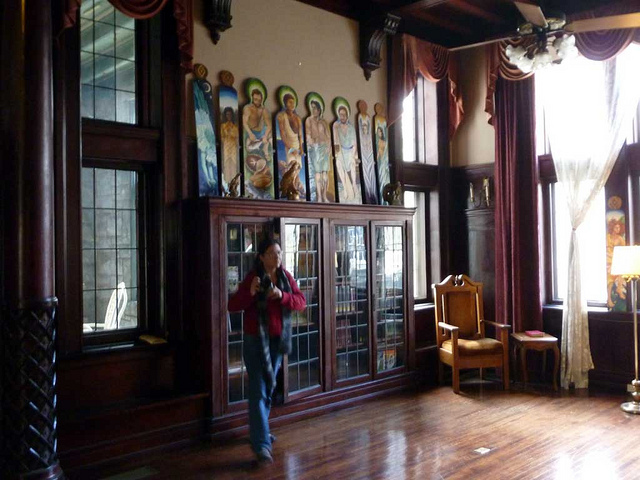 The valances over the window were original to the house, although the drapes were installed by Turner films when they were here filming a movie at St. John's. The two wooden chairs in the corners are from a German drinking club that was frequented by many St. John's families. Profits from that club were donated to St. John's and a nearby German Catholic church. 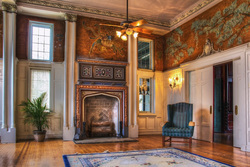 The Stone Mountain Room, currently used as the Choir Room by St. John's, was called the Living Room by the Venable / Mason family and unlike the Phoenix Room, which was a more formal parlor, it was filled with more comfortable family room furnishings. It is now called the Stone Mountain Room because of the mural surrounding the room of woodland scenes from Stone Mountain. Like the grass cloth in the Phoenix Room this mural was also painted by Mrs. Leilla Venable Ellis, Sam Venable's sister. As noted before, the family once owned Stone Mountain and first conceived of the Confederate Memorial there in this home. The Sun Parlor still has the original Venetian tiled floors, stenciled beams, and green mortar between the granite stones. The chandelier is original to the room and was found still hanging above the suspended ceilings during the renovations. The matching lamp is now hanging in the Summer Parlor downstairs. The hooks in the ceiling may indicate that at one time there was a swing in this room. When the Venables and Masons lived here, this room was decorated with statuary by sculptor Gutzon Borglum, the sculptor of Mount Rushmore and the first phase of the Stone Mountain carving. It is said that Borglum stayed with the family in this home during the time of his carving of Stone Mountain and it was at Stonehenge that plans for carving the Confederate Memorial at Stone Mountain were first made. This entrance was originally the side or carriage entrance to the house. Originally there was a separate carriage house, also built of Stone Mountain granite, which contained the servants' quarters. This building was torn down after the church purchased the property and the stones used to build the retaining wall for the parking lot.